Nonprofits have a unique relationship with cybersecurity. They often work with smaller budgets than for-profit companies, so sometimes fewer resources are available to keep things as secure as they could be. There is also sometimes a feeling that since they are doing social good, they aren't prime targets for criminals. For these reasons, nonprofits are demonstrably more vulnerable to data loss. But keeping your organization's data and IT systems safe from cyberattacks (such as malware and phishing), natural disasters, and accidental losses is crucial to your mission. The ultimate recovery cost of rebuilding in the case of any of these events could be crippling. TechSoup offers all the technology products your organization needs to build a security framework you can rely on — and that are within your budget. We created this handy comparison chart to give you an overview of how we might be able to help. After taking a look, schedule a call with us and take our basic security review. This free consultation enables your nonprofit to take a step closer to ensuring that the right security technology is in place. The basic security review is recommended for small to medium-sized organizations that are just getting fundamental security set up. For more advanced needs, organizations can also talk to one of our consultants, who can set up new security technology quickly and cost-effectively. 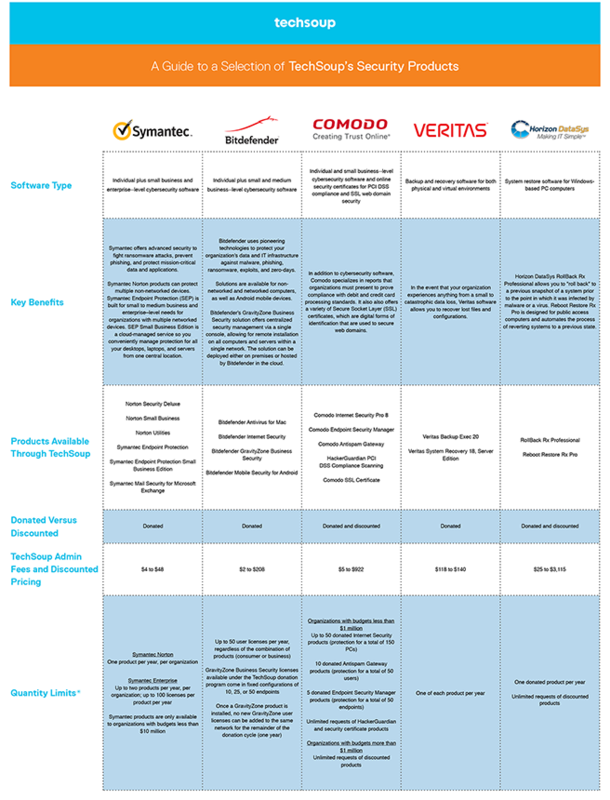 Click on the preview image below to view the PDF comparison chart. *One year means one fiscal year (from July 1 to June 30). Please visit our Product Catalog and Nonprofit Eligibility Requirements and Donor Partner Restrictions pages for more information on all of TechSoup's nonprofit offerings. Get TechSoup's free tips on staying safe online for nonprofits (blog post and PDF) or register for our free webinar. Learn more about how you can Keep Your Nonprofit Safe with TechSoup's Security Products.